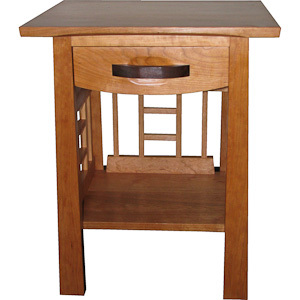 The Wiscassett Nightstand combines the beauty of thin crisp lines using a little Asian flair. The design is based on the Rockland Nightstand, but with a lattice around the shelf to hold books. The piece shown is made from solid Cherry with a Walnut handle for accent. The pieces matches the same details that can be seen in the Rockland Bed. Click on the picture for additional views.